The PCT is spectacular, and the path is usually quite safe for horses. But parts of it can also be tough and unforgiving – don’t underestimate the trail, or overestimate your ability or your horse’s capability to travel on it. Prepare well, and be as experienced as possible before setting off on any long equestrian journey. It’s imperative that you discuss the journey with other experienced long distance riders and that you consult your veterinarian before starting out. Unfortunately, serious injuries and death are real possibilities. As a rider, your primary responsibility is to always look out for your safety – and also for the safety and well-being of your horse and those around you– to take care as you travel that no one will become injured or suffer. Riders need to be concerned about the safety of hikers who are not always aware of how to handle horse encounters. Talk to hikers to let them know of your approach. By replying, they are letting your horse know that the animal with a huge back may actually be a human. Often, a hiker’s instinct is to step to the high side of the trail to let horses pass but a horse is less likely to spook at hikers who are not looming above him. In any event, if you encounter multiple hikers encourage them to stay on the same side of the trail. Visit our backcountry skills page for general advice. Take your own safety seriously. Consider always keeping essential survival supplies on your own person while mounted. Some riders keep what they would need for overnight survival in a backpack or easily removable bag. Becoming separated from your horse can happen. Especially if you ride alone, you need supplies to be able to survive if your horse goes missing. Look towards the thru-hikers for equipment advice. You too can travel the PCT with ultralight gear. Your backpack becomes part of rider weight and therefore it may be easier for the horse to carry than if it were “dead weight” packed in your saddle bags. Increasingly riders are wearing riding helmets on the PCT. If you wear a helmet, attempt to find a way to shade your face. Be prepared for the unexpected fall. You will realize the need for head protection the moment you’re exposed to abject danger. It can happen suddenly on the PCT. Mountain bikes, while not allowed on the trail, may pose a danger to riders. Know that you may encounter bikes and that your horse may spook. Frequently, horses will spook when they see llamas for the first time. They don’t interact well. Llamas are allowed on the PCT. They are rare but you may encounter them. Prior to your PCT journey, find some llamas and see how your horse reacts. Do not allow your horse to become dehydrated, offer him water whenever possible. Always offer him water before hobbling him to let him graze. 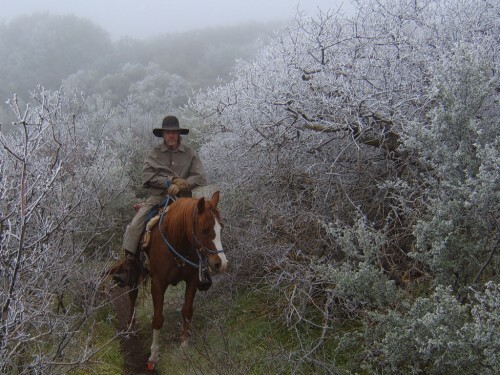 Before starting your PCT ride, have your horse checked by your veterinarian. Have their teeth checked to be sure that they can properly chew what they eat. It may be necessary to float their teeth. Talk to your veterinarian about carrying specialized medications such as Betadine, Banamine, and Butazolidin (Bute). Carry a basic horse first aid kit. This could literally save your horse’s life. Better, of course, to take care and avoid risky situations, stress and feeding problems. Horses can get entangled in lines. Have a knife at hand capable of quickly cutting any rope you use. Become aware of what your horse is eating. Some plants are toxic to horses. Avoid lupine as much as possible. You will see it throughout most of the PCT. A hungry horse will want to eat it as it apparently smells and tastes OK. Also watch out for clover – while unlikely, a lot of clover at one time will be too rich in protein and can cause colic. Colic can be life-threatening and it is unfortunately common on the PCT. If your horse has signs and symptoms of colic, you should seek a veterinarian’s care. Ask your vet about what meds to carry in case any of these forms of colic occur on the trail. It can be caused by abrupt changes of diet that happen on the trail. When someone meets you with horse feed (usually alfalfa and grain) that is very different from the grass that your horse has been eating while on the trail, problems can arise. You should take care to assure, by planning ahead, that there will be as much consistency as possible in what your horse eats – by feeding him some supplemental processed feed every day, between resupplies, while on the trail. Do not let your horse gorge on large amounts of grain and alfalfa after a simple diet. Other causes contributing to colic include over-exerting horses that are out-of-shape and overheated and then letting them drink large quantities of cold water. Small sips of cold water consumed over time as your horse cools is best. Always give your horse an opportunity to drink. Dehydration must be avoided. Before beginning your trip, be sure your horse is on a routine worming regime, as parasites are a common cause of colic. Start your trip slowly and work up to more miles as is comfortable for you and your horse. Know the symptoms of colic. For example, your horse may become sluggish, appear dull and in pain. He may begin kicking at his stomach or reaching and biting at his flank. He may want to roll constantly. He may give little uncharacteristic bucks. His stools may be scant, dry and hard or even non-existent. His pulse may be 80-100 bpm as compared to the average normal of 40. If his pulse reaches these levels, you have a very serious colic. You should be familiar with capillary refill times as well. With Azoturia, your horse becomes stiff, “ties up”, and has difficulty walking – or can’t walk at all. Know the signs and symptoms of Azoturia. The first sign may be dragging or scrapping of a foot as he walks in a way not usual for him. He may have board-like muscles and pass dark coffee or wine -colored urine, which results from the destruction of his red blood cells. He may be sweating and be in obvious pain. Stop riding immediately! Know how to treat Azoturia. Offer him small amounts of grass and water. Allow him to rest, hopefully in a shaded place. Do not attempt to continue on the trail. The horse may need a couple of days of rest before continuing after he begins to recover. If you try to move on too quickly you may do permanent, lethal damage to your horse’s kidneys. A common cause of Azoturia is feeding your fit horse too much rich grass (clover) or grain, and then over-stressing him after a period of lack of exercise for whatever reason. Start your trip slowly, increasing your miles as you and your horse are able.